There are so many beautiful fashion trends for fall. It's hard to narrow it down, though there are a few trends I don't yet have, and a few old ones (like a wool coat) which I can never get enough of. I'll be posting plenty of fall fashion guides and trend reports, though these are a few of my personal favorites. 1. Something Warm. . A tailored wool coat is a fall/winter staple for me. I currently have one in camel, but I've had my eye on this Vince Camuto Funnel-Neck Wool Coat. I love the clean lines and the funnel neck. 2. Something Burgundy. There is always one color for fall that dominates the trends in women's fashion. This year it's this beautiful shade of burgundy. While I'd love that Miss Selfridge burgundy fedor pictured above, I'll take anything in burgundy. The color goes so well both black and brown, and it looks so rich when paired with gold accessories. 4. Something Western. Western boots are a huge style trend for fall 2013. I haven't actually owned a pair of cowgirl boots since high school, but I think it may be time for a new pair. 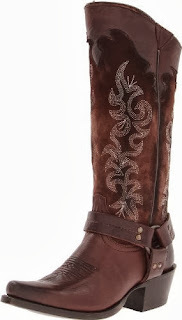 I love the detailed stitching on these FRYE Lily Harness boots. 5. Something Bold. I love to wear blazers during fall and winter. It's so easy to pull together a chic look with jeans and a plain tee with a blazer on top. I finish off the look with a bold pendant necklace. Pictured above: Crystal Visions pendant necklace by Just Fab. 7. Something Purple. While I love the burgundy trend for fall, another hue has caught my eye. This deep purple shade is so perfect for pairing with the dark neutrals of the season. When I see a big purple satchel I just want to hug it! That's totally normal, right? A fedora is always welcome!